Corsair has brought its liquid cooling technology to a new PC market segment today, with the launch of the Hydro Series H5 SF. 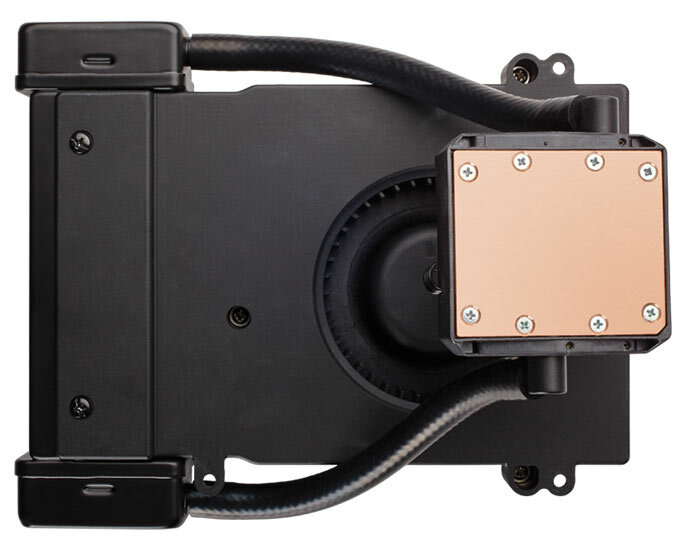 This is a quiet and efficient low-profile liquid CPU cooler which caters for "the smallest of PCs" and is capable of dissipating up to 150W of heat. The heat generated in a small form factor PC can be more difficult to deal with due to the limited airflow in a small chassis and the fact that many such systems are discretely squirreled away from any exterior air flow. Corsair says its new Hydro Series H5 SF low-profile liquid cooler can even cope with an overclocked CPU in such confined environments. Corsair's Hydro Series H5 SF is reputedly easy to install and measures just 84mm in height. The design allows the unit to be fitted directly atop of any Mini-ITX motherboard with no need to attach the H5 SF to any external fan mounts or brackets. 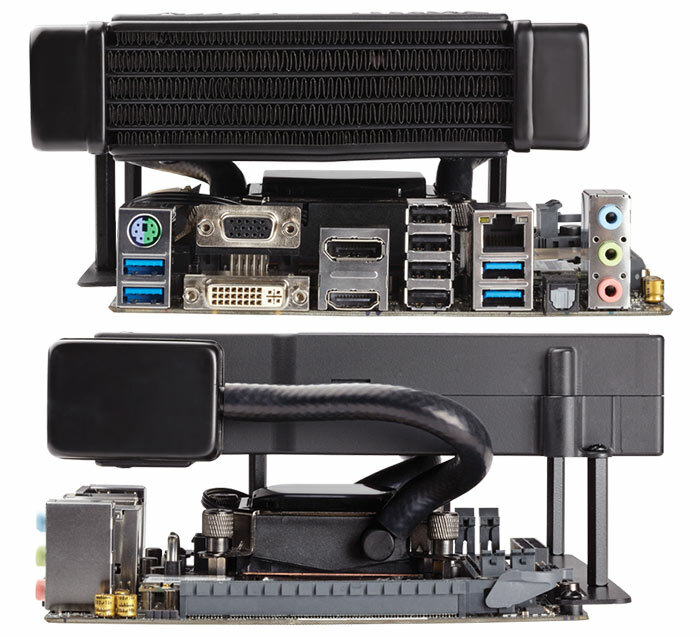 That's great for maximum compatibility with a good number of systems based upon the mini ITX design and motherboards. A copper cold plate, as pictured below, takes heat directly from the CPU towards the integrated 120mm x 40mm radiator, which is then exhausted by a low-noise tuned 120mm blower fan. As a cooling side effect, the bower fan draws air over other heat creating motherboard components like VRMs and chipset heatsinks. 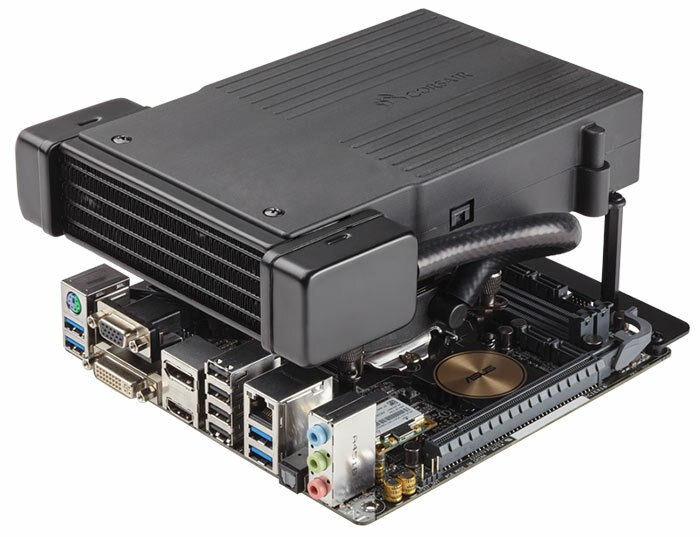 Ultimate SFF compatibility - Mounts to any Mini-ITX motherboard with no external fan mounts. The H5 SF is said to be fully compatible with other Corsair products such as the Obsidian Series 250D, Carbide Series Air 240, Graphite Series 380T, and upcoming Bulldog 4K computer chassis. This liquid cooler is 'available immediately', however at the time of writing the official product page and other links weren't yet published. But definite congratulations to Corsair on this idea… and fingers crossed that it performs well! !